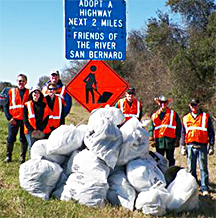 Trash was collected along two miles of FM 2611 before and after the Churchill Bridge on Saturday, Feb 16. The litter along this stretch of road is picked up four times a year. If not collected, it ends up being washed into the San Bernard. 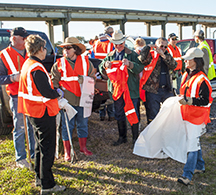 The FOR Adopt A Highway volunteers who picked up trash for two hours were Chairman George Zwicker, Valroy Maudlin, Susan Bailey, Barbara Fratila, Ken Wright, Wayne Head, Sherry Folger, Tom Ronayne, Ange Ronayne, Clay Nagler, and Nick Fratila. Dressed in red safety vests, the Trash Team gathers next to the Churchill Bridge. Trash filled bags are stacked and ready for pick-up by TxDOT.